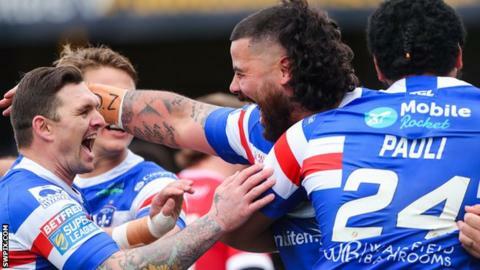 Wakefield scored four first-half tries to set up a 33-22 win over Salford Red Devils in Super League. When Jacob Miller crossed just after the break and Danny Brough continued his perfect record from the tee, Trinity's lead was 20 points. Salford then battled back with two converted tries to make the hosts edgy. But a penalty and drop-goal from Brough took his day's tally to 13 points, calmed the home fans' nerves and ensured Wakefield completed victory. Salford have now lost three successive games since their emphatic 46-0 win at Catalans Dragons and slip to fifth in the table. Trinity's win lifts them to fourth and they rarely looked under threat from the Red Devils, but for a brief second-half rally. They started the match quickly and in the end the points gathered before the break proved enough. David Fifita was first over the line, picking up a loose ball after a succession of errors from both teams to cross under the posts. Salford immediately hit back through Niall Evalds' finish from a Derrell Olpherts grubber kick, but Ryan Hampshire, Reece Lyne and Pauli Pauli all crossed for Wakefield before the break - with only Kris Welham replying for Salford - to secure an advantage too big to overhaul. When Brough's superb reverse kick sent Miller in to touch down the game looked safe, meaning a quick-fire double from Olpherts and Jackson Hastings never got the visitors within a score. And when needed, the ever reliable Brough was on hand to kick his team three further points clear, giving them the breathing space to see things out. "A bit of ill-discipline let them back in and my one criticism is that we kind of go into our shell when we go in front. It's something we need to be better at. "We knew they were going to come back. They're a good attacking side and caused us a lot of problems in the second half. "But I thought we did a good job on their key players and I thought our game management towards the end of the match was good." "We weren't good enough in the first half. Wakefield were completing sets at 100 per cent and we were down at 50 - you can't afford to give up that much ball. "We were compounding that with penalties and it gave us a bit of a mountain to climb. "They controlled the speed of the game in the first half, when Danny Brough was really clever with his kicking game. "We keep showing we can compete but we need to start with that same mentality." Wakefield: Hampshire; Jones-Bishop, Lyne, Arundel, Tupou; Miller, Brough; Fifita, Wood, England, Pauli, Ashurst, Arona. Interchanges: Crowther, King, Kopczak, Horo. Salford: Evalds; Olpherts, Bibby, Welham, Chamberlain; Lui, Hastings; Lawton, Lussick, Dudson, Jones, Griffin, Flanagan. Interchanges: Burke, Walker, Turgut, Inu.